Two, three or four-doors, we’ve got you covered. COUPES ARE COOL and have curves in all the right places. But not only do they look great out on the road, and on your driveway, but they are also fun to drive and feel a little sporty too. If you are looking to get behind the wheel of one of the sexiest styles of car out there, then we’ve rounded up some two, three and four-door coupes. The Ford Mustang two-door, four-seat coupe is one of the coolest coupes ever made. 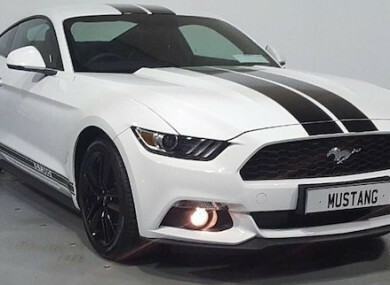 This particular car looks extra cool with its ice-white body, black contrasting go-faster stripes and jet black rims. It is powered by the 317hp 2.3-litre Ecoboost engine, which produces 432Nm at 3,000rpm and the iconic coupe can go from 100km/h from a standstill in just 5.8 seconds… quicker than some Porsches, FYI. The Subaru BRZ is a two-door, four-seat coupe, although those rear seats are quite a squeeze. It is a fun car to drive with a playful chassis and rear-wheel drive. It is powered by a 200hp 2.0-litre petrol engine and it’s pretty quick too with this manual version going from zero to 100km/h in 7.6 seconds. The Mercedes-Benz CLA is a handsome and slinky four-door coupe and, thanks to its front-wheel drive set-up, is pretty roomy inside too. This particular car is the 180 d model meaning it is powered by a 109hp 1.5-litre four-cylinder diesel engine and this one is paired with a 7G-DCT dual clutch automatic transmission. The BMW 2 Series Coupe is a four-seat, two-door coupe with plenty of personality. It is good to drive and handles really well. This SE specification car comes with a full leather interior including leather sports seats, steering wheel and gear knob. It also comes with parking assist with front and rear parking sensors. The Volkswagen Beetle is a three-door coupe with classic looks but all the safety, technological and luxurious features you’d expect to find on a modern car. This particular example comes in sporty R-Line trim with 18-inch ‘Twister’ Volkswagen Exclusive alloy wheels and black contrasting sunroof. Email “5 cool coupes that'll cut a dash at the kerb”. Feedback on “5 cool coupes that'll cut a dash at the kerb”.